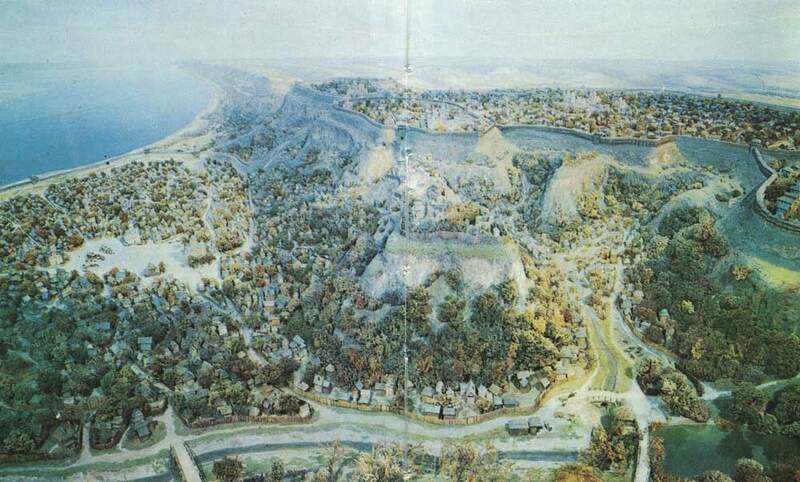 Culture | “Diorama of ancient Kiev X-XIII centuries.” (From left to right: Hem, Starokievskaya Mountain, Castle Hill (front pla ns), Potters Kozhumyaki, Kopyrev end). Artist AV Kazan. The State Historical Museum of Ukraine. “Diorama of ancient Kiev X-XIII centuries.” (From left to right: Hem, Starokievskaya Mountain, Castle Hill (front pla ns), Potters Kozhumyaki, Kopyrev end). Artist AV Kazan. The State Historical Museum of Ukraine. Golden Gate. The outstanding architectural monument of the fortification art and history of Kievan Rus’. Reconstruction in 1982. Authors: EI Lopuschinskaya, S. Vysotsky, NV Kholostenko. In 1983, trehyaruskom pavilion erected on the Golden Gate, is a museum of “Golden Gate”.The monument to Prince Vladimir Svyatoslavich. 1853 Sculptors Vasily Demuth-Malinovsky and P. Klodt, architect KA Ton. Mounted on the lower terrace of Vladimir’s Hill, at an altitude of 70 meters above the Dnieper, the monument combines well with the silhouette of the Dnieper hills. Bronze sculpture of the prince in the mantle with the cross and the grand cap in hand stands on a 16-meter cast iron pedestal and crowned with an octagonal pedestal in the form of the pseudo-style chapel. Brick-lined cast iron pedestal plates and decorated with bronze bas-relief of the east side of “Baptism of Rus’ and the old coat of arms of Kiev.